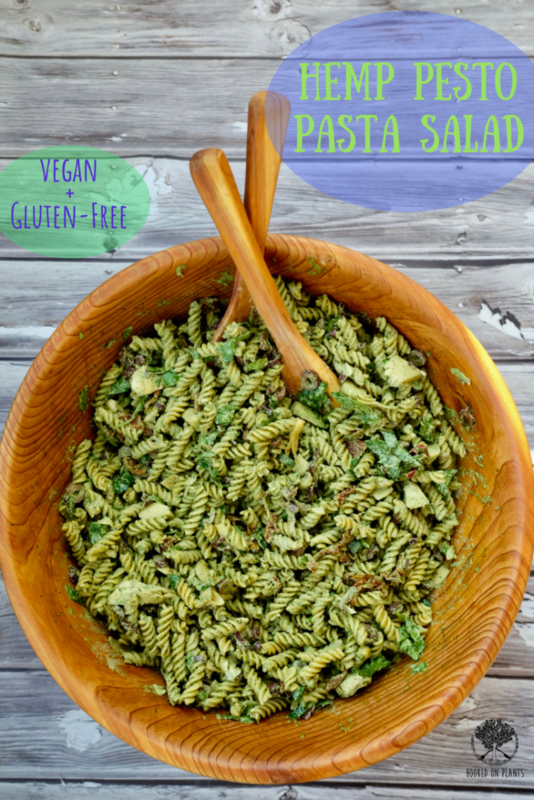 This is the meanest, greenest vegan hemp pesto pasta salad on the block! Super flavour-y brilliance without the parm, oil, or gluten. BOOM. To do list: make the pesto, boil the pasta, throw in some flavourful colours and you have yourself a meal! Not only does this bode well for potluck-style weddings (which is what our weekends have been filled with this month), but it’s also a saviour when it comes to busy weeks and last minute dinners. 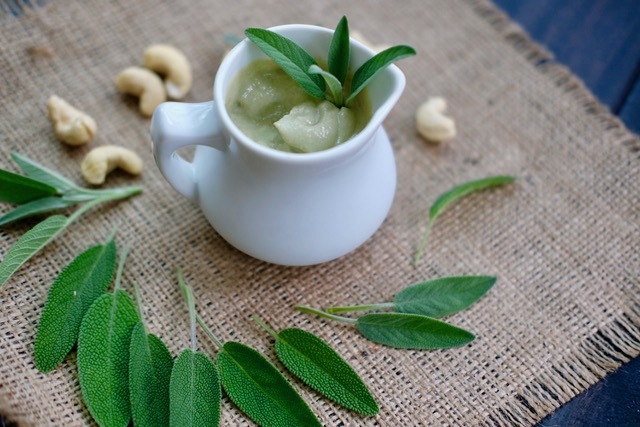 Just make a TON of this goodness and your week will be stress-free in the food realm. 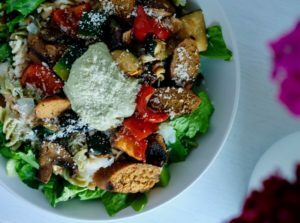 Serve it up with a big ol’ salad drizzled with this dressing, and spruce it up by adding different proteins each night (tempeh, smoked tofu, seitan or sausage slices, anything gardein, veggie burger chunks… you get the drift). Easy & plant-based… that’s what it’s all about! I’m working away at an e-book for you guys! All you need to know about being plant-based for a week with 30 recipes, nutrition tips, and a whole week of meals planned out for you. 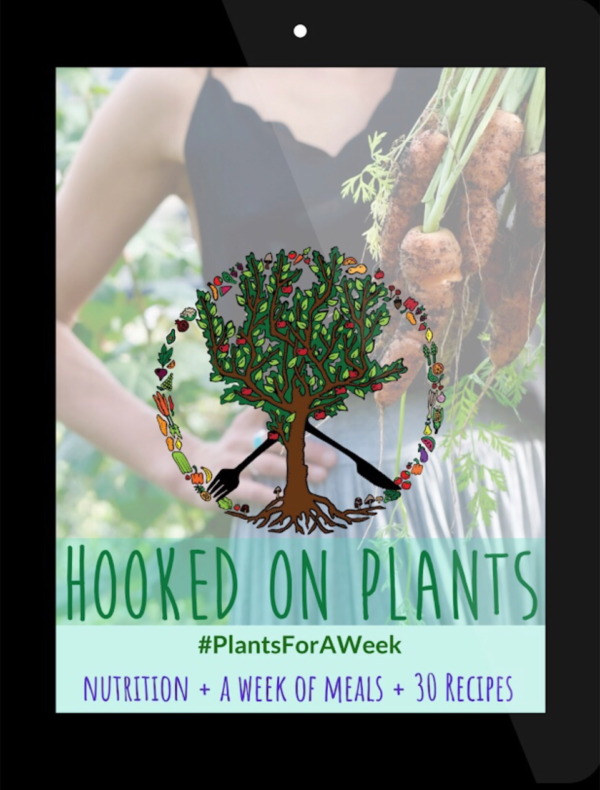 Get in touch with me on Instagram by tagging @hookedonplants and #plantsforaweek and let me know what questions you have about this lifestyle that you want to be answered in my E-book! I’d LOVE to hear from you! 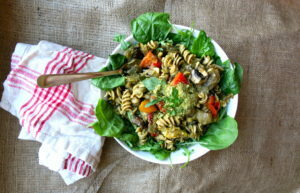 A pesto pasta dish to please the whole family, or just you for a whole week!! This stuff is great for leftovers, and shines at those potluck dinners. 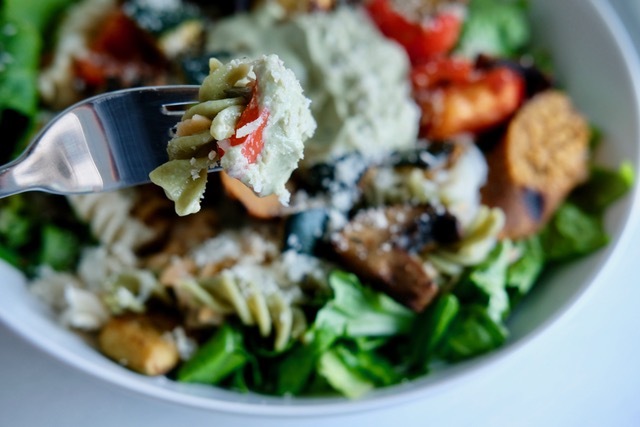 Mix the pesto, pasta noodles, artichoke hearts and sun-dried tomatoes together in a large bowl, then top with extra basil leaves. 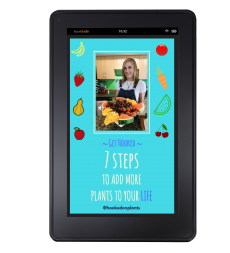 Sign up to my emails for weekly inspiration, recipes, plus a free PDF on How to Get Hooked On Plants! This week was all about you and your relationship with you GUT. SO interesting! Lucky for you, you’ve found yourself on a page with the secret to my new favourite sauce…all mixed up with the pasta that tells me ‘summer is on, baby’! 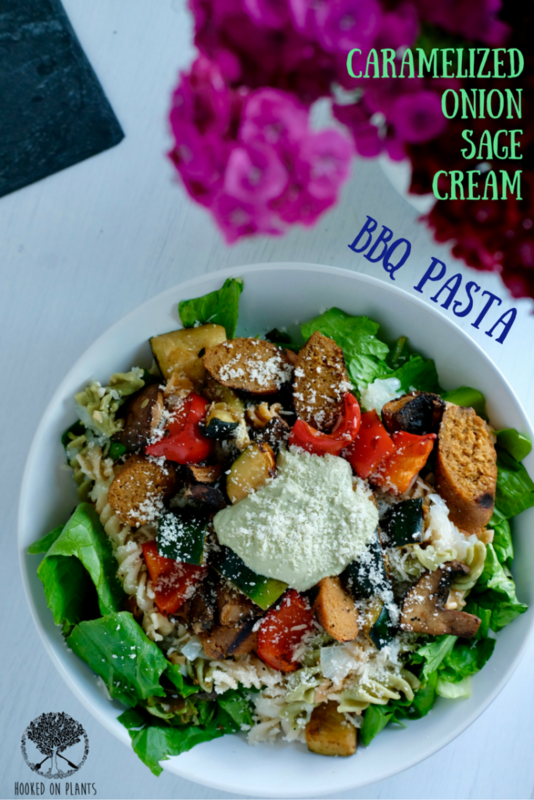 This creamy vegan pasta could easily become a staple for those summery patio days. Serve it up family style. 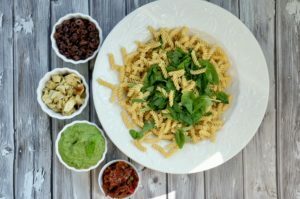 Picture this… an outdoor picnic with a big bowl o’ pasta, a salad bowl packed with greens drizzled with this flavourful oil-free dressing, and a bowl of smokey vegan parm…now all that’s missing is funky tunes and fruity popsicles. Caramelized onions give anything a deeper, sultry taste. Double or triple the caramelized onions I call for in this recipe, just so your fridge can be a good friend by having it on hand for your next savoury meal. 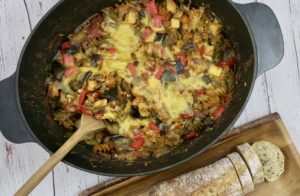 The BBQ’d veggies give this pasta a smokey flavour, and keep the house a little cooler than the oven would on a hot summery day. Zucchini has a good dose of antioxidants to help prevent disease, vitamin C to boost your immunity and potassium to help balance electrolytes and blood pressure. Onions contain sulfur, which is needed for the synthesis of the antioxidant glutathione, plus it helps strengthen hair and nails. A simple dinner packed with nutrients. A go-to weeknight scramble recipe. Make lots of it, because the leftovers taste better by the day! Caramelize onions: heat large pot to medium, then add onions. Let brown a few minutes, then add ¼ cup water. Turn down the heat, add the garlic and let simmer for 30 minutes, lid on. Stir every 10 minutes or so to make sure they're not burning. If they're sticking just add a bit more water. Heat the BBQ to 400°F. Prep the veggies by adding the coconut oil to your hands and massaging the oil all over each piece of veg and place on the grill. Twist some salt and pepper on them, and let cook for 10 minutes. Meanwhile, bring a pot of water to a boil. Once boiling, add a dash of salt and pour in the pasta. Cook according to time on the package. Flip the BBQ'd veggies, and salt + pepper the other side. Let cook another 10 minutes. Throw the sausages on the BBQ. Cook for 8 minutes, rotating every couple of minutes. Strain the pasta and pour the pasta back into the pot. Make the sauce: add all sauce ingredients to your blender, and blend until smooth. Sign up to my emails for weekly inspiration, recipes, plus a free PDF on How to Get Hooked On Plants. This week was all about manipulating your genetics with diet! The magic of Avo is at it again. 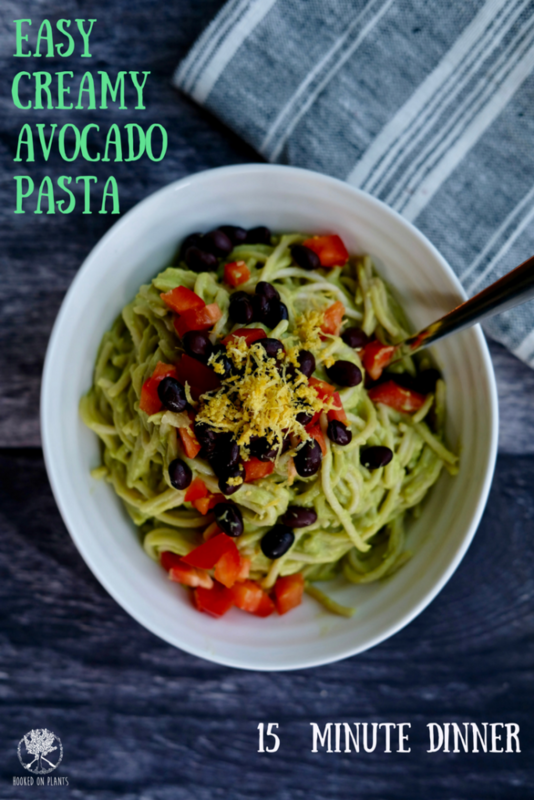 Avocado pasta is the answer to your dinner woes. 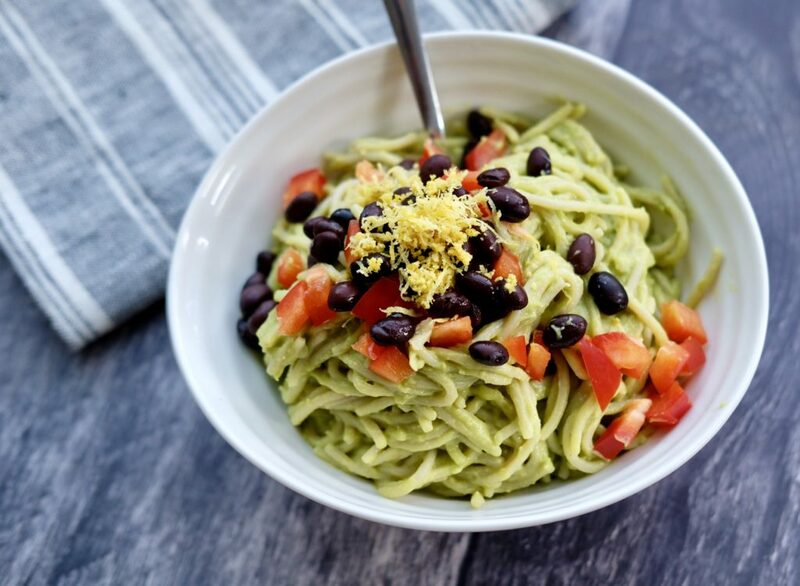 Whether you’re vegan or not, this pasta is a super easy weekday dinner to fall back on and it’s packed with a ton of nutrients and flavour…all in under 10 minutes. Serve it up with a salad and you’ve got yourself a super satisfying, delicious dinner staple. If you’re making the switch, it’s all about figuring out your new staples as a new vegan. Think about it. How many different types of dinners do you make in a month? I’m guessing it’s probably just a handful of go-to recipes you have in your repertoire that you cycle through (nothin’ wrong with that!). Turning veg just means veganizing these go-to’s, or finding a handful of vegan dinner options you love, then creating a new recipe cycle. 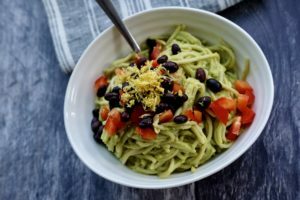 The longevity of this lifestyle relies on simplicity (and tastiness, of course), and that’s where recipes like this avocado pasta shine. Not only is the past simple, but it’s such a crowd pleaser. 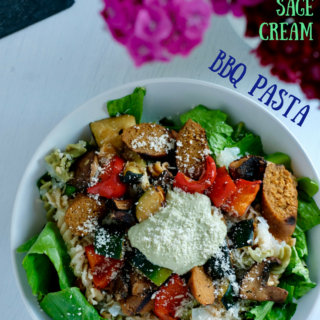 It’s creaminess without the heaviness of your typical creamy pasta. Kids will gobble this stuff up too, so if your tasters are little munchkins, then definitely give this one a try! I get overly excited every time I use the spirilizer, like a kid in a candy shop. 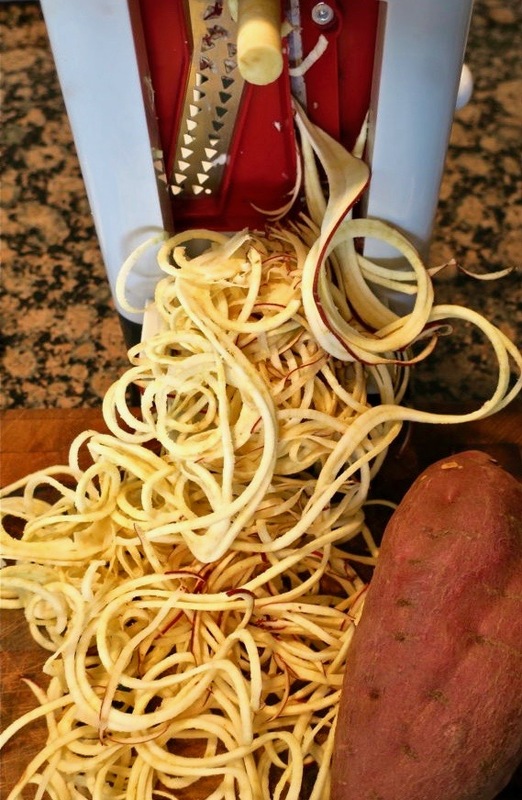 You get so much ‘spaghetti’ out of just one yam (or any other veggie you choose to spirilize, like yicama, carrot, beet, or zucchini). Yams are packed with vitamin C to boost your immunity and aid in healing your wounds. Avocados are packed with monounsaturated fats, minimizing joint pain and arthritis, hydrating your skin and strengthening your hair. Garlic is an antibiotic and anti-fungal. The sulfur compounds will help keep your blood pressure in tact. 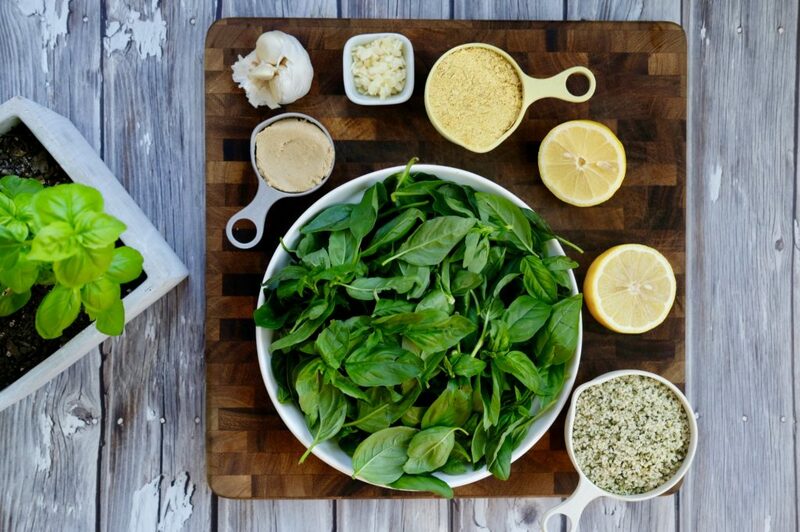 Adding lemon to the crushed garlic enhances the sulfur compound allicin, so this sauce is a perfecto comination-o! This is a go-to staple dinner recipe! It takes 10 minutes and curbs that creamy, comfort-food craving. Meanwhile make the sauce: add avocado, lemon juice, garlic, nutritional yeast to food processor and blend until smooth. Top it off with beans, red pepper, lemon zest and this vegan parm! A vegan Thanksgiving dish to bring to any dinner to curb those fall comfort food feels! Rainbow forests, crunchy leaves, crisp mornings & cozy teas. Does that count as poetry? But really, I do love fall. Seasons make you truly appreciate each one when you’re in it. The summer (as usual) went by in a blink. We always pack it to the brim with as much adventure in the sun as we can fit. Paddle boarding. Biking. Camping. Hiking. Dancing. Now is the time, with the changing of seasons, to have an excuse to take a step back. Cooking, minimizing the closet, dinner catch ups, catching up on … everything?! Well, here is a recipe to add to your autumn vibes. Even if this holiday is traditional with the turkey and all, this is a perfect vegan Thanksgiving recipe to bring for everyone to try. After living in France for years in her 20s, ratatouille is something my Mom has conquered and makes all the time. I decided to give it a bit of a twist this time to make it even more comfort-food approved. 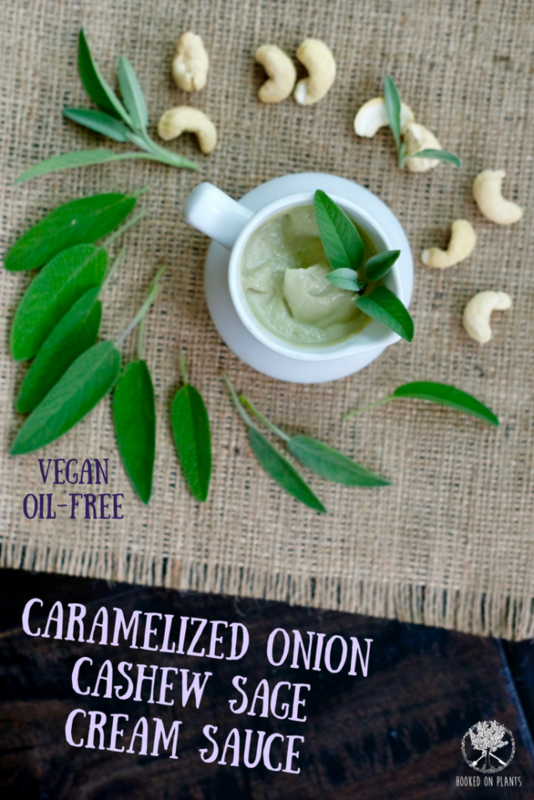 This recipe tastes ‘melt in your mouth-y’, and gives you that feeling of eating something heavy, but it’s actually packed with veggies and nutrients, light on the tummy, great on the digestion, and nice to your waist-line. This passed the comfort-food taste test from the comfort-food lover (aka Davey), so I’m confident that you’ll get those comforting vibes from this dish too. I always get my smoked tofu from Spud, but if you head to any vegan meat section of the grocery store these days, you’ll be able to find an organic smoked tofu block. You can use any vegan cheese for the topping (this is optional, but totally takes it to next level awesomeness). 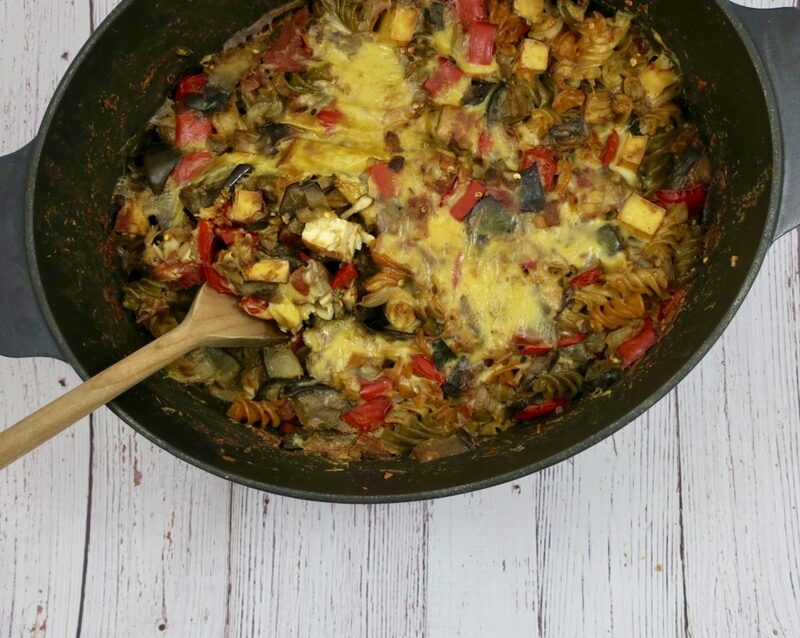 Or, top it off with some vegan parmesano with this easy recipe from here. Eggplant is a great veggie for weight loss because it’s packed with fibre, with no fat or cholesterol. It’s also beneficial for bone health, not only because of the calcium content, but also the potassium content to help the uptake of the calcium! Also, if you’re worried about anemia, eggplant is the veggie for you because it’s packed with iron. It’s brain food too because of all the phytonutrients it packs! 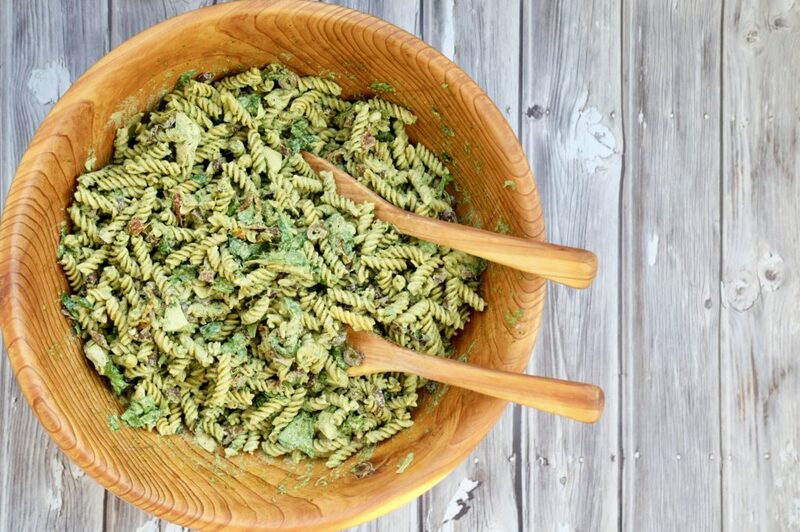 Brown rice pasta has just 2 ingredients; brown rice & water. SO many people are afraid of pasta, or any carbs for that matter. But white pasta, refined sugars, and overly processed or fried carbohydrates with a bunch of ingredients are giving carbohydrates a bad name. 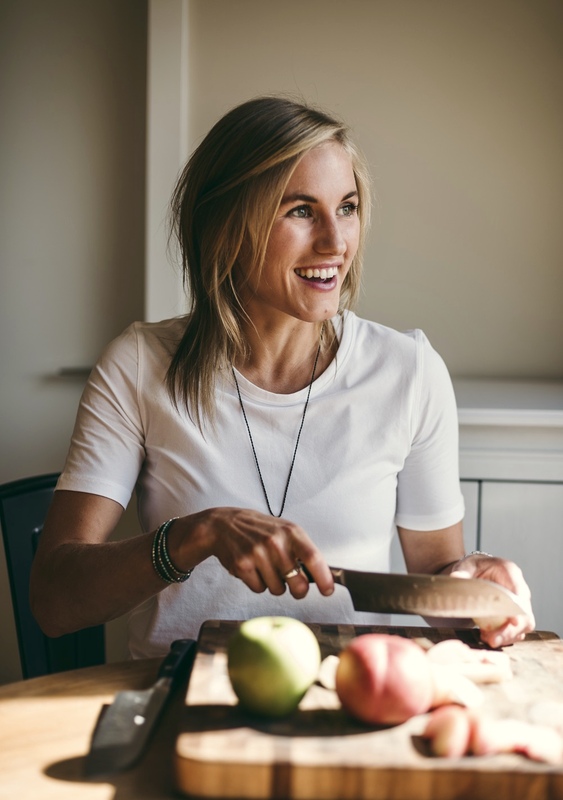 Carbohydrates, even pasta with minimal whole food ingredients, are what our body thrives on. 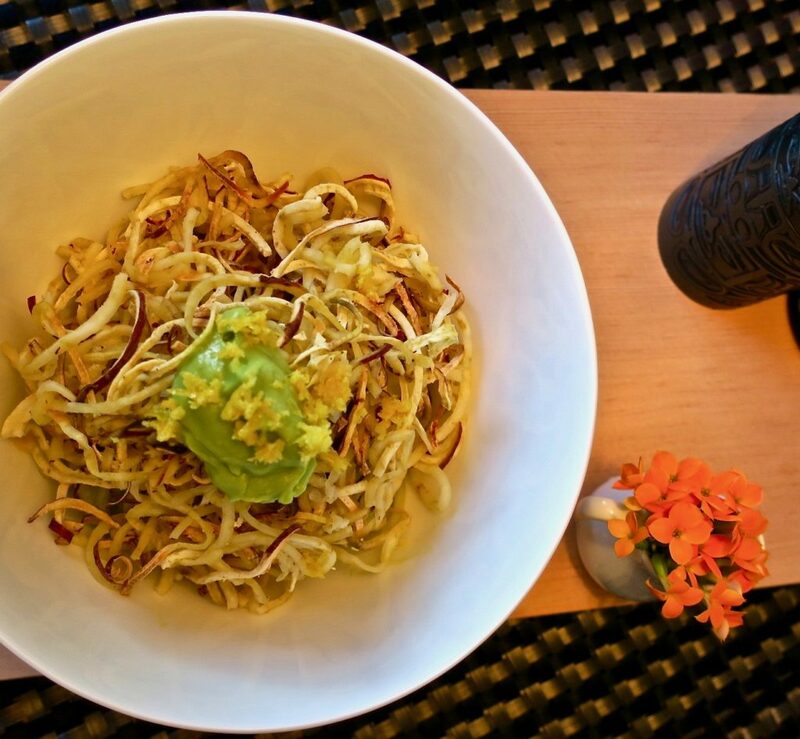 So go for it with the brown rice pasta, quinoa pasta, soba noodles, baked potatoes, and brown rice! It’s brain food and good energy that our body loves. Veggies galore! This recipe is a great way to pack in a bunch of veggies. The more veggies we have in our diet, the longer we’ll live and the better we’ll feel. Duh. A perfect vegan Thanksgiving dish to bring to dinner this year! Add mushrooms, red pepper, zucchini and eggplant. Sauté for a few minutes with ½ cup water. Add diced tomatoes (or can of tomatoes). Stir, then let simmer 20 minutes. Bring pasta water to a boil. Cook pasta according to directions, then strain. 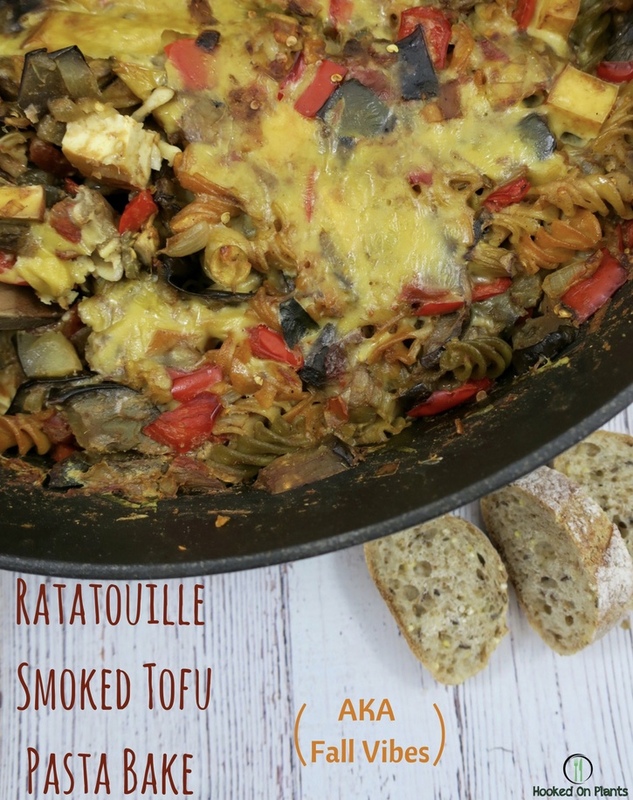 Mix pasta and smoked tofu into the ratatouille pot. Bake, lid-on for 5-10 minutes, and continue baking with the lid off for 3 more minutes to brown to top layer. (+ exclusive resources & tips)! Summer. Sun. Hot weather. Late light. This all calls for firing up the barby and throwin’ on those veggies.